Soybean enriched, rice-based gluten-free breads were designed incorporating a structuring agent (hydroxypropylmethylcellulose, HPMC) and a processing aid (transglutaminase, TG). At dough level the effect of increasing amounts of soybean protein isolate (SPI), HPMC and water was studied in the Mixolab. 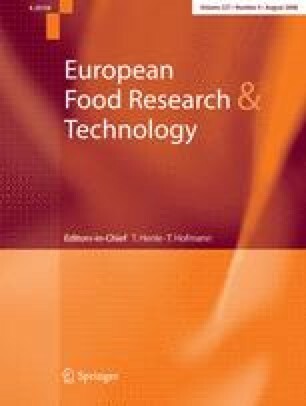 Mixing and thermal characteristics showed the significant effect induced by water, soybean protein isolate, HPMC and TG, allowing the selection of the appropriate amounts for the breadmaking performance of enriched gluten-free breads. The single addition or in combination of 4% HPMC, 13% soybean and 1% TG produced significant changes in the physical properties of the rice-based gluten-free breads. The presence of SPI blended with rice flour produced a significant decrease in the specific volume of the bread, although this detrimental effect was partially counteracted by its combination with HPMC, decreasing also the crumb hardness. The micrographs of the crumb showed the beneficial effect of the HPMC, obtaining a more open aerated structure. Protein enriched, gluten-free breads can be obtained with a combination of SPI, HPMC and TG. This work was financially supported by Comisión Interministerial de Ciencia y Tecnología Project (MCYT, AGL2005-05192-C04-01) and Consejo Superior de Investigaciones Científicas (CSIC). C. Marco gratefully acknowledges the Ministerio de Educación y Ciencia for the grant.